Hong Kong, now officially Hong Kong Special Administrative Region People’s Republic of China, consists of a mainland on the country’s southeastern coast and about 235 islands. It is bordered on the north by Guangdong Province and on the east, west and south by the South China Sea. Hong Kong was a British dependency from the 1840’s until July 1, 1997 when it passed to Chinese sovereignty. In 1841 British naval officers hoisted the Union Jack over the empire’s newest addition. At the time the land was a barren island with hardly a house upon it. Today it is covered with skyscrapers. Hong Kong’s mainland consists of the urban area known as Kowloon and a portion of the New Territories, a large area that became part of Hong Kong in 1898. Lantau Island, ceded to Hong Kong as part of the New Territories but often considered separate from that region, is the largest island. Located about six miles east of Lantau Island and across Victoria Harbor from Kowloon is Hong Kong Island. The city of Hong Kong, also known as Victoria, faces the harbor on the northern part of the island. In total there are only 422 square miles of land area. 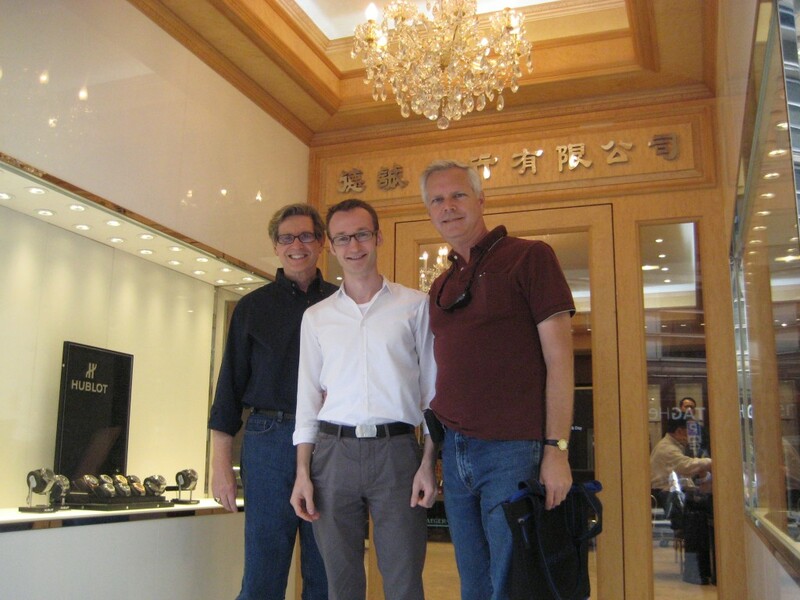 Christoph, one of the students we mentored at San Diego State several years ago, now lives in Guangzhou, China, about two and a half hours from Hong Kong by train and subway. He came to meet us in Hong Kong for a visit. He is working at a company that designs and has manufactured anything that you would find on a desk top, from stationary to a stapler. Most of the products are made to clients’ specifications and sold in Germany. He is also developing a unique furniture line, which is customizable and is made of heavy duty cardboard. We had lunch with Christoph at a German restaurant along the harbor on the Kowloon side. It was not far from where our ship is docked next to the Star Ferry clock tower. After lunch we wandered the streets looking for an ice cream shop only to end up at a McDonald’s for a sundae. Christoph looks exactly as he did in San Diego and we were very pleased that he would take an entire day to travel as far as he did to visit us in Hong Kong. He has a Chinese girlfriend and has been in China working for a couple of years. After we left Christoph, we headed over to the Hong Kong Museum of History where we saw an incredible permanent exhibit on the story of Hong Kong. This extensive museum with over 4,000 exhibits takes you from prehistoric times 400 million years ago to the areas’ development in modern day. It shows you in films, as well as photos and physical items, about the geology, history of the people, the folk culture and historical development. After a quick bite to eat onboard the ship we met up with our friend, Jenn, and headed out to the night market on Temple Street. During the day this market is the Jade market but at night it transforms into a market for just about anything. Block after block, the road is pedestrian only with stall after stall of shops selling silk, items, clothing, jewelry, shoes, wood carvings, children’s toys and more. Tourists flock here to find a bargain and negotiating with the vendor is part of the deal. Nothing is priced so you must ask the price and then negotiate for a lower price. Kent purchased a few Chinese silk wine gift bags but that was it for our shopping.